When I was in college, I had a professor who was fresh out of the Massachusetts Institute of Technology (better known as MIT) and in his first year of teaching. He was a brilliant linguist – a genius if ever there was one – but his first semester teaching undergrads at B.U. wasn’t going so hot. Did you ever meet someone who was so smart that they couldn’t connect with other people? Well, for about six weeks, the other students and I had this professor pegged as that guy. We struggled and wrestled with the course material, wading through stacks of academic articles for which we simply had no context. We weren’t connecting the dots. It was clear our professor knew everything there was to know about what he was teaching, but we were all just missing the point. I stayed up late nights reading, met with classmates at the library, and even skipped an ultimate frisbee tournament to try to wrap my head around everything I was supposed to know. I thought I was doomed to fail a class in my major, in a subject I loved. But right after midterms, Paul did something we didn’t expect. He asked us what we were struggling with. I can’t remember exactly what our issues were at the time, but I do remember that from that point on in that class, everything changed. He started giving a different kind of lecture, one that started with questions and ended with all of us students arriving at new understanding. Where Paul had been almost an adversary – something we’d have to overcome if we wanted to get a decent grade for the class – he became our coach and advisor, helping bridge the gap between what we didn’t already know and what we needed to master. He became my favorite professor, and I’m sure I told more than a few people to take classes from him. What does this mean for you, Blogger? I’ve already touched on writing for that one ideal reader, focusing on helping that person overcome challenges, solve problems, think differently, or be inspired. But if you’re somehow missing the mark, if people are coming to your site and leaving without so much as a comment, then you need to ask the right questions. Even if you only have a handful of subscribers so far, what made them subscribe to your blog? What was the thing that caught their eye? Why did they decide that instead of just reading the content they came for and leaving, they should agree to hear from you more often and become part of your community? What are the things you’re doing well, and which of their problems have you not solved yet? What do your readers struggle with, and how can you add value to their lives? If you’re smart, you’ll use the answers to all of these questions to plan your next steps on your blog – at the very least, what posts you need to write to really help your existing readers. 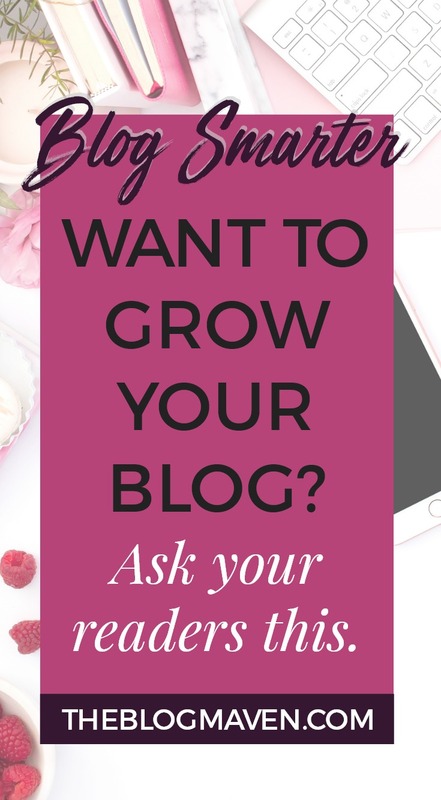 But this process will help you do something even more powerful than getting to know the people who already read your blog – it will help you step up your game and blog better for your target audience as a whole. And having a better blog, friend, will help you connect with new audiences, with more subscribers and a growing community that is passionate about sharing your work with others. What questions are you going to ask today? How are you going to ask them? What are you going to do once you have the answers? Share this post, then leave me a comment below and tell me how you’re going to start (or keep!) connecting with the readers who need you. Duh…you would think I would have asked my followers but no. I can guess what they are struggling with, but hey, now I’m going to ask and see what comes up. Thank you so much. 🙂 When you do ask and decide to make some changes, I’d love to hear how it goes for you. Please keep me posted! I agree with Brook. I write about education, so I assume I know what readers want and need, because I am an educator. I guess it’s time to ask exactly what they need. Thanks for the insight, Jeni, and for the inspiration, Brook. It’s pleasing to know that even a professor is learning all the time! How important it is to never stop growing. Must have been really humble of him to ask what his students were REALLY struggling with, as that is sort of indirectly saying that he failed to get his teachings points across despite his professor status. It’s a great question to always ask ourselves. How can we add value? Great article. I appreciate you taking a moment to answer someone else’s comment, Jeremy! One other idea to add about my professor’s humility is that it also helped him become more approachable and “real” to the students. As I’ve said before, people don’t connect with blogs – they connect with people. I think you gain a lot of loyalty by showing that you’re really concerned with what will make your readers’ lives better. Thanks for reply. You are totally right. People connect with PEOPLE, period! It’s a simple concept, really, and the quicker we realise this, the better. I really do not think a blogger should ask readers what they should write or what they want them to write. Blogging is a personal thing (unless it is some sort of self help site) and you should write for yourself not other people. Great post Jeni! I did a survey a little while back and gathered up the responses. The funny thing is..I feel like I haven’t really implemented them. I can’t really figure out how best to do that. Now that’s it’s been some time, maybe I should go back and revisit the survey and see if I can look at it differently and get some new ideas…and maybe ask the question again..”what are you struggling with :)” Thank you! Yep, it only works if you act on it. 😉 Thanks for sharing your experience, Shari Lynne – if you make any changes, I’d love to hear how it goes for you, so please keep me posted! We have a nice blog and we get good traffic but our readers just don’t seem be connecting with us and I’m not sure why. They cone to the site, read, and leave. Some will come back but only when we maybe update with something that interests them and they see it on Twitter or Pinterest. I feel like we aren’t a site our readers are bookmarking to check back on, you know? I thought about posting a poll to see what they want to see more of but I’m not sure how many would respond. We offer an ebook for signing up for our newsletter and it helped grow our subscriber numbers but only 20% actually open the weekly update. Any suggestions? Of course there could be any number of different things going on here, but I think since you have the statistics available, it’s probably a good idea to step back and look at which of your posts are getting the most traffic, which posts have the lowest bounce rate, and which posts have the highest amount of time readers are spending on the page. Then take a look at the same information on your newsletters – which types of headlines get the most opens? Which ones have the most clicks through to your website? Part of understanding what your readers need is looking at the behavior of the people who are already there and experimenting with giving them more of what they’re already responding to…and also cutting out the things they’re not responding to. One other question I might ask you is, do your site readers know what the benefit of subscribing is for them? Aside from the free e-book, I mean. Do you tell them what to expect and why you’re the best person to deliver that? Amber I have the same issue. I have great traffic but almost no subscribers. I tend to get more comments on controversial posts but those are few and far between and I’m a travel blogger so I can’t be controversial all the time. 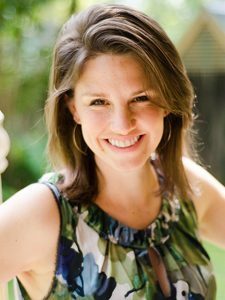 After your last post, I sat down and wrote a list of 45 future blog posts with my one reader in mind (after reading your article, I knew exactly who she was!). It has helped me immensely to keep her in mind when I’m writing and when I’m deciding what to write. Asking myself how I can add value to my readers’ lives will help me focus that list even more, helping me to get closer and closer to the blogger I want to be. Thanks Jeni! I ask as part of my site’s autoresponder series because the answer to this question can give you so many ideas for posts and opportunities to help someone directly via email, which can make a fan and friend for life. I need to do a better job of doing this more often, more than just in the autoresponder, because it’s such a powerful question. Thanks for the reminder! I just set up email subscription through mail chimp. I am new to blogging and this comment was very helpful. Thanks! I am going to look into this. Great idea! Thank you! I plan to do that tonight on my Facebook page and see what feedback I get. Then I will do the same on my blog. If I help them, they will keep coming and and use me as a resource. I would like to solicit ideas and struggles from my readers, but I’m not sure how best to do it. I’ve seen FB engagement drop off terribly in the past year (since Pinterest became big), and my comments slowed before that. I rarely have readers comment on the open-ended questions I put at the end of blog posts, and nowadays when I post questions on FB I don’t get a response (because they’re not seen by anyone). ?? Hi Gina, I appreciate you sharing your challenge here. Have you thought of holding a live event – like a Google Hangout – where people can ask you questions? Like a Q&A session your readers are invited to. 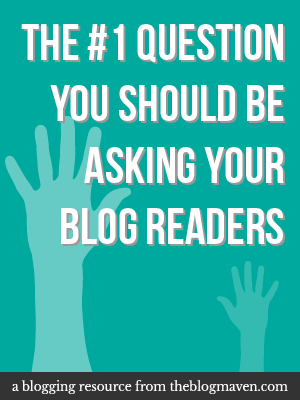 The questions you get there would really help you get a taste of what your larger audience probably wrestles with. Plus, you’ll be introducing yourself in a much more personal way to your readers, and people are more likely to interact with someone they feel they know. I hope this is at least a little food for thought… So glad you’re here! I haven’t asked this exact question but have tried to engage my readers in other ways. I find the most engagement comes from other bloggers not my straight readers. I am hoping as they get to know me they will feel more comfortable commenting. You are so right! Whenever I ask a question related to my content I usually get people to reply. Often is the case, the best answer (approach) starts with a simple question. The one caveat I have with this “what are you struggling with” question is when it comes from the person (too soon). For some reason, it doesn’t seem as sincere when that question comes up too soon in the relationship. The question I ask my clients is; Who do you want to be a hero to? Given my profession in the social seo space, it fits more often than not. I’m just starting out. This isn’t my first blog, but it’s the first one that I’ve been passionate about. Interesting how one of the first rules of blogging is to write about your passions. I hadn’t been doing that until now. What I have been doing in the meantime is seeking to understand personal branding and marketing. I’ve wanted (for years) to write a novel and one of the most complicated aspects of doing so is marketing the novel and branding yourself as the author. The most important thing I’ve learned is how significant communication is in creating relationships with the people who will eventually purchase the product. I ask questions all the time. It’s not just about creating a call-to-action in the blog post itself, but about communicating through social media. Commenting isn’t everything: Questioning serves the purpose of finding out where the reader is today and what s/he needs to get from the blog. Today was launch day for me and I already have a small handful of people asking me for tutorials about how to play the ocarina. Knowing what the reader wants to get out of the blog will help me to know what content to keep refreshing, what to pare back on, and how to keep people coming back. Fingers crossed, it’s also going to help in the future with advertising partnerships. If I’m delivering what my readers want, my hope is that some of the sellers I currently buy from will be interested in reviews and advertising partnership because I’m answering the questions that their customers ask. Sounds like you have a great plan, Becki. Cheering you on as you move forward! this site is really very inspirational and conducive . I would like to create a mathematics blog where I am intended to show the very basic math concept in an intuitive way and as I am currently unemployed So I would like to make some money also from this blog.is it possible or not?I am extremely beholden to you for your response . I am a new blogger, I always wonder: what will I share to the reader? You seriously have shown an amazing perspective about blogging. Following everything that you have mentioned here can truly be helpful and inspiring, which can ultimately get subscribers and readers. It is indeed all about knowing what exactly does the reader look forward to and the effort should lie in connect to the readers in a personal manner.